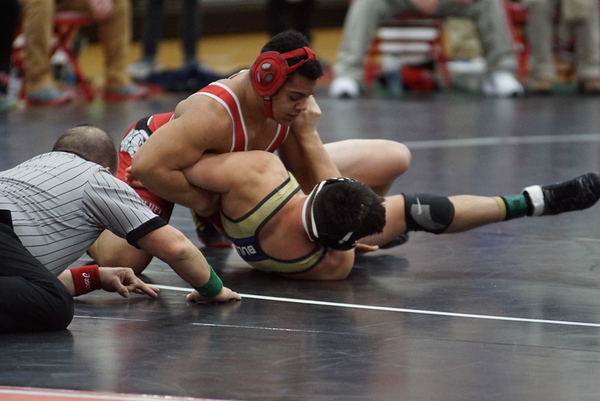 (LIMA) - Five Bluffton Pirate wrestlers advanced to the OHSAA District Wrestling Meet after finishing in the top four of their individual weight classes at the Lima Central Catholic Sectional Meet. Junior Deandre Nassar improved to 34-1 on the season as he won the 195 class with 3 pins and a 15-4 victory. Nassar’s biggest goal this season is to return to Columbus and he lived up to his #1 seed. Deandre pinned Parkway’s Justin Frank in :19, Pandora-Gilboa’s Hayden Blank in 3:31 and Ada’s Erryk Katayama in 1:08. In the final, Nassar downed Columbus Grove’s Dakota Sargeant. Sophomore Landen Luginbuhl (220) and freshmen Jeremy Sturgeon (106), Tayton Kleman (113) and Josh Mehaffie (120) all finished third in their classes to move on. Luginbuhl dropped Cory-Rawson’s Zerich Magnell with a late match pin at the 5:27 mark before falling 10-4 to Grove’s Dylan Sargeant in the semifinals. Landen pinned Jefferson’s Jordan Bonifas in 3:51 before eking out a 2-1 victory in a rematch with Magnell in the third place match. Jeremy Sturgeon opened his run with a pin of Coldwater’s Nick Kline before being pinned himself by Wayne Trace’s Gabe Sutton. The freshmen rebounded with a pin of Ada’s Colton Biederman and then defeated #2 seed Jordan Kennedy from Allen East by a 4-2 count. Kleman also won by pin to open his tournament in just 56 seconds over Parkway’s Treya Conn. Coldwater’s Brian Chmielewski got the best of Kleman 17-2 sending the frosh to the Consolation Bracket. Tayton pinned Lincolnview’s Luke Bullinger and then earned a hard fought 4-3 victory over Wayne Trace’s Seth Meggeson in the third place match. Josh Mehaffie lost 15-0 in the semifinal to Allen East’s Drake Carmean but rebounded with a win by pin over Spencerville’s Grayson Ford. Elijah Conley finished fifth at 152 and is an alternate for Districts. Also competing for BHS were Trent Pearson and Jesse Montel who saw their season come to an end.